Questions found at Jenni Elyse's blog. 1. Has your favorite character changed in The Two Towers? If yes, why? I still love Aragorn, but I have to admit after the second half of the book, Sam has my heart. He is just such a positive person! It's fabulous to have someone going into the very heart of darkness and still be thinking about what comes after. 2. 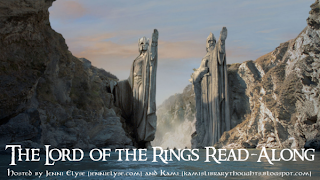 Which do you like more, The Fellowship of the Ring or The Two Towers? Why? I like Fellowship, just because we are introduced to everybody and Two Towers was much more of a war book, with the giant battle at Helm's Deep. But I do love the new characters from Two Towers...so not really one or the other, but both? 3. Do you think Frodo and Sam should have killed Gollum? 4. What do you think about Book Faramir vs. Movie Faramir? Bah. When I first saw Two Towers in the theater and Faramir says "the ring will go to Gondor" I was like WHAT????!?!?!? There has never seemed to me a good reason for that change, other than they got to throw in another super violent fight at Osgiliath. I absolutely think Faramir is a unique character and changing his reaction to the ring and the choices he makes totally ruined it for me. I can now enjoy the movie more, but it still upsets me. 5. Why do you think Frodo trusts Gollum? I wouldn't say it's entirely trust, but I think Frodo feels a sort of kinship with him, as a ring bearer and definitely feels pity for one so twisted by its power. I think he is able to see that he himself might have ended up like that if he had the ring for so long too. Also, the promises that he extracts are ones that pretty much have to be honored by Gollum, even if he can sneak around it a bit. Plus, he remembers that Gandalf thought Gollum still had a part to play in the ring's journey. 6. If you were in Sam’s place, would you have made the same choices if you thought Frodo was dead? I probably would have taken the ring and made a run for it. I doubt I would have gone back to Frodo, unless I knew he wasn't dead. (Though, I'm with Kami, let's not leave him lying around in the open.) I think Sam had never been in a situation where he had to take charge and it was super hard for him! Bonus choice: Aragorn. He'd make sure we had enough to eat and he'd probably know where he's going. 8. On the flip side, do you think Frodo should have had a different member of the fellowship with him instead of Sam? No. I think Aragorn might have been more handy, but I definitely think Sam was the one that Frodo really needed. His outlook, support, and friendship are really what Frodo needs, more than a guard and a fighter. 9. How has the ring affected Frodo so far in the story? I don't think we've seen it as much in the second book. It shows a lot more in the movie, but I think it's been kind of slow in the book. It does talk about how he feels weighed down, heavy, and pretty much makes him tired and unable to sleep. I think that's part of it's menace is that it kind of slowly and subtly runs you down until you don't even notice it's changing you. 10. What was your favorite moment in Book 4? Can't wait to get to the last book! Ah, I love rereading this series. Thanks, Kami and Jenni Elyse! I'm making some headway and I'm almost done, thank goodness. But, I have to say that I'm not looking forward to reading the Shelob scene. It terrified me in the movie and I suffer from arachnophobia big time. We'll see if I can get through this. And, I probably would've fallen out of the hammock too. Or, gotten so tangled up in it from flailing and screaming, I couldn't get out myself, lol. Yeah, I'm a fellow arachnophobe, so I know how you feel about that scene in the movie. Spiders are the worst! Ugh. I think my previous comment just got eaten by the internet. I shall valiantly try to recreate it. These are great answers! Your responses to two and five echo my sentiments completely. And, on nine, was anyone else reminded of the descriptions of Harry hauling about the horcrux in Book 7?